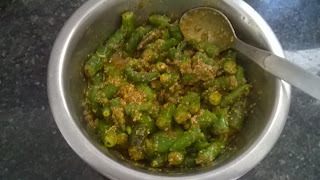 Green chilly pickled with mustard seedsorhari mirch ka sarson wala acharis very easy to make recipe that needs just a couple of days to get ready this pickle. Preparation Time- 10 min. Wash and dry the chilies. Cut in to small pieces and keep aside. Heat a pan and Dry roast all masalas, except salt. Make a coarse powder the mustard and dry roast masalas. Mix the coarse powdered masala with chilis and add oil, hing and salt. Mix properly all ingredients and bottle them. Keep in sunlight maximum 2-3 days. The chilies release their juice within 2-3 days and you would see a watery liquid in the bottom. Shake the jar once in a while so the pickling is evenly done. The pickle is ready after 2-3 days of pickling but keeps maturing for 2-3 weeks before getting too sour. 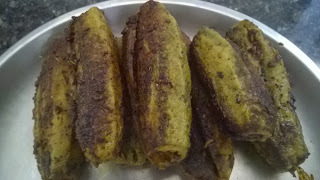 Bharwa Karela (Biter melon) is a unique spicy and tasty Side dish. This is one vegetable not liked by many because of it bitterness, but it is widely used in Indian cooking throughout India. And our beauty of kitchen vegetable cooking is that even the karela turns delicious. Preparation time- 10 min. Cooking Time- 20 min. First take karela peel out properly and wash.
Make a lengthwise slit halfway through the karela from top to bottom. Now take a pan and roast all dry masalas, except red chilli powder, amchoor and haldi.